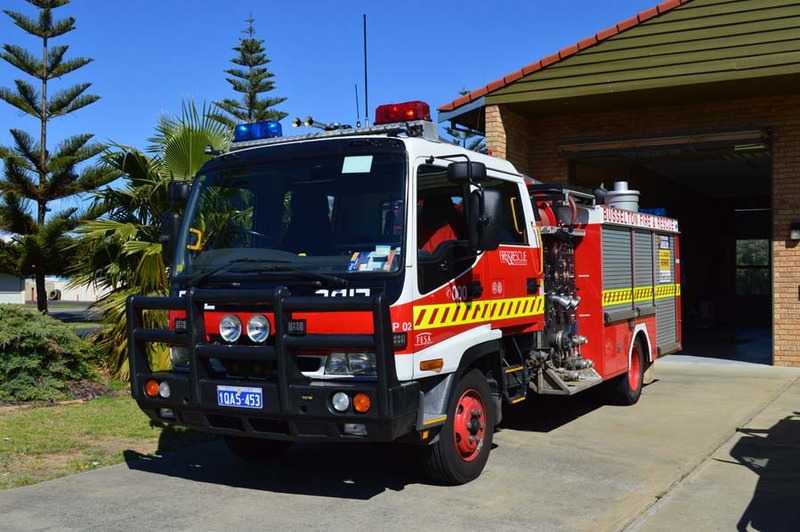 It’s design is based on the Scania appliance used at Perth Metro stations, but has been adapted to requirements of country towns that have more bush area’s. The appliance carries 1200 litres of water as well as rescue equipment and breathing apparatus. More safety features are added such as louder sirens and air horns together with much better safety lighting both for highway use and perimeter lighting for night time incidents. Please click here to view additional images. The fittings locker holds a variety of items. Suction hose - used to obtain water out of rivers or swimming pools when normal supply is not available. Ropes - used for a variety of reasons, mainly securing wreckage and rescuing persons. First aid kits - a large supply of medical equipment in case the ambulance is not available. Oxyviva - Oxygen supply for people who are overcome by smoke or injured. Couplings and fittings - to connect and split hoses from the pump to the fire. AWG branch - a branch which has a large throw of water, mainly used in hot fires.